Samsung announces the Galaxy Camera 2, to follow our last years Galaxy Camera. I was fortunate enough to have purchased a Galaxy Camera and have mixed emotions when hearing the next generation will be on our shelves in the coming months. I'm satisfied with my Galaxy Camera, but out of the box it was a little less than ideal. To be expected Samsung crammed it with countless bloatware apps, pretty much everything you'd expect to see on your typical Galaxy S3. The slightly confusing thing was, many of the apps added you wouldn't expect or ever want on a Camera device. I found there was simply too much running in the background and rendered the device quite sluggish, many of the apps were not allowed to be naively removed either. Viewing the running processes, my RAM was almost always 75% used. leaving very little for a snappy system to work with. It wasn't until I rooted this device and froze nearly half of the list of apps, did this Camera become a top notch shooter for its time. The Galaxy Camera takes amazing pictures in the hands that know how to use it. Obviously low light issues can play a factor like on any camera, but Samsung knows how to put a great quality camera together. We know this from their Galaxy series phones as well. I've always praised Samsung phones for their Cameras. 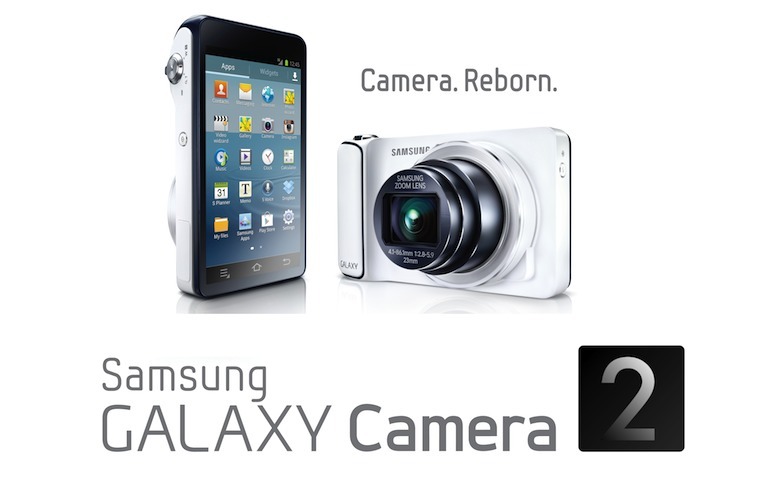 The Galaxy Camera 2 is said to have the same sensor as the previous generation, along with a 1.6Ghz quad-core processor, 2GB of RAM, but with only 8GB of internal storage. With all Samsung's bloat crammed in there, Samsung says only 2.8GB will be user accessible. Thankfully for Samsung's support of micro SD cards, we'll be able to increase that to a maximum of an additional 64GB. It'll also feature a 4.8" screen running Jelly Bean OS 4.3. Focusing (no pun) on what really matters with this device. It'll have a 16MP Shooter with a 21x Optical Zoom. Most of these specs aren't too impressive over the previous generation, but Samsung claims the Galaxy Camera 2 will have an improved image processing system that'll as they say, “produces images of exceptional quality, unrivaled by smartphone photography". We can of course expect to see a host of new features being that we'll also be seing an updated version of touchwiz. However I have a concern as a previous generation owner. As a full fledged Camera device, getting prompt updates is not something that's in dire need. However, that being said the Galaxy Camera is stuck at 4.1.2 and it's roughly a year old. Samsung seemed to have turned their back to this device in terms of updates. I just hope they pay a little more attention to the Galaxy Camera 2 to keep it in good standings with the customers who'll buy it.